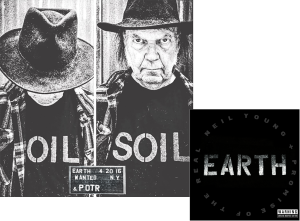 Neil Young’s upcoming album Earth (in stores June 17th) is one of the most unconventional releases in his long catalog, according to Rolling Stone. On May 6th, Young will unveil Earth at the Natural History Museum Los Angles County’s First Fridays series. The album features 11 songs from his 2015 tour with Promise of the Real mixed with sounds of the Earth. On Wednesday night, July 22 Neil Young took his Rebel Content Tour to Mansfield, Mass., where he played at the Xfinity Center with Micah and Lukas Nelson from Promise of the Neil. 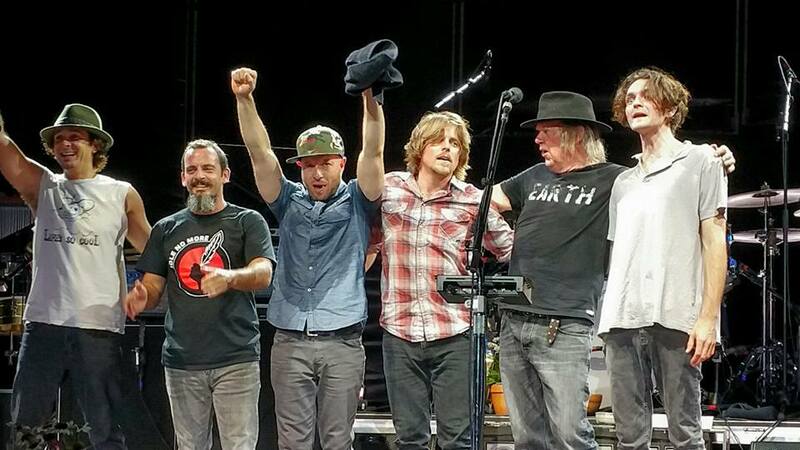 His last show on this tour will be tonight, Thursday, July 24 at the Wayhome Festival in Oro-Medonte, Canada. 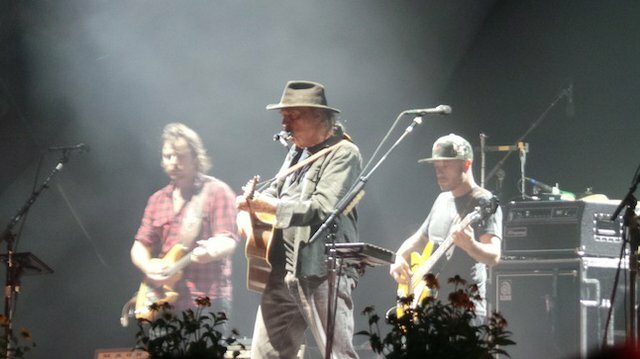 A review of they concert by Stephen Peterson of the Sun Chronicle says Legendary singer-songwriter-guitarist Neil Young just keeps plugging away as he approaches his seventh decade, and remains as spirited as ever.He writes that several of the new album’s songs were part of the set in the 2 1/2-hour show, which may have disappointed fans wanting to hear more of the folk rocker’s popular tunes. But there were several rarer vintage songs featured, too. “Taking yet another jab at corporate America, Young called the concert venue Great Woods twice. ‘No corporation can buy your history,’ the ever-rebellious Young told the crowd. Norah Jones’ alternative country group, Puss n Boots, a trio whose members all sing, opened. 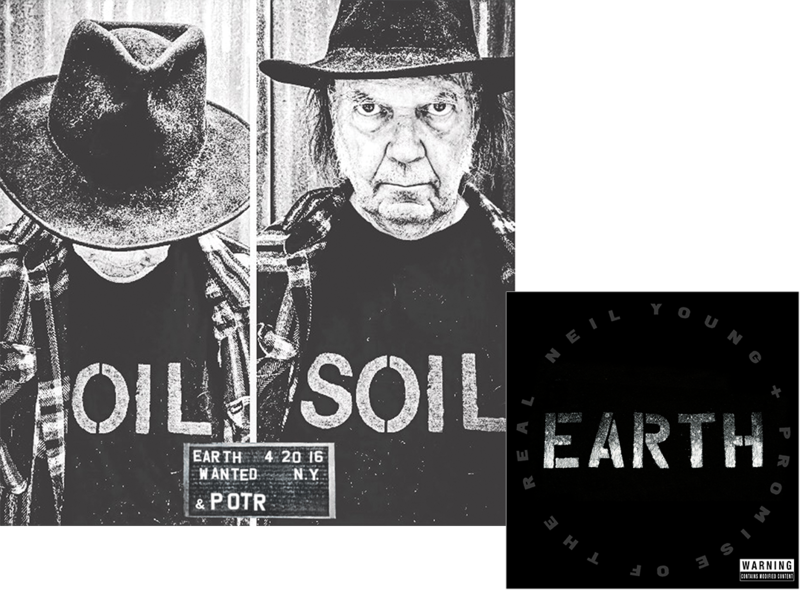 Here’s a message from Neil Young that was posted on his Facebook page on July 23. He has also released a 10-mnute short film Seeding Fear, which tells the story of a farmer named Michael White, who with his father Wayne, took on the corporation in court. The film was released by Shakey Pictures and co-executive-produced by “Bernard Shakey,” Young’s pseudonym. As I write this, the dark act is up for a vote in the House of Representatives; representatives of the people. The dark act takes away the rights of those people to vote for or against things like GMO labeling in their states. It does seem ironic. If the act is passed, it will truly be a dark day for America. Monsanto is a corporation with great wealth, now controlling over 90% of soybean and corn growth in America. Family farms have been replaced by giant agri corp farms across this great vast country we call home. Farm Aid and other organizations have been fighting the losing battle against this for 30 years now. Dairy and meat farming is done in those white sheds you see from the freeway, no longer on the green pastures of home with the old farmhouses and barns. Those beautiful buildings now stand in ruin across the country. This has happened on our watch while the country slept, distracted by advertising and false information from the corporations. Monsanto and others simply pay the politicians for voting their way. This is because of “Citizens United,” a legislation that has made it possible for corporations to have the same rights as people, while remaining immune to people’s laws. Both Democratic and Republican front runners are in bed with Monsanto, from Clinton to Bush, as many government branches are and have been for years. This presidential election could further cement the dominance of corporation’s rights over people’s rights in America. If you have a voice you have a choice. Use it. On the human side, the film I would like you to see tells the story of a farming family in America, but the same thing is happening around the world. It is a story that takes 10 minutes of your time to see. It is a simple human one, telling the heartbreaking story of one man who fought the corporate behemoth Monsanto, and it illustrates why I was moved to write The Monsanto Years. The film presents a rare opportunity to hear from the source as Mr. White is one of only four farmers who is still legally allowed to speak about his case as all the others have been effectively silenced. 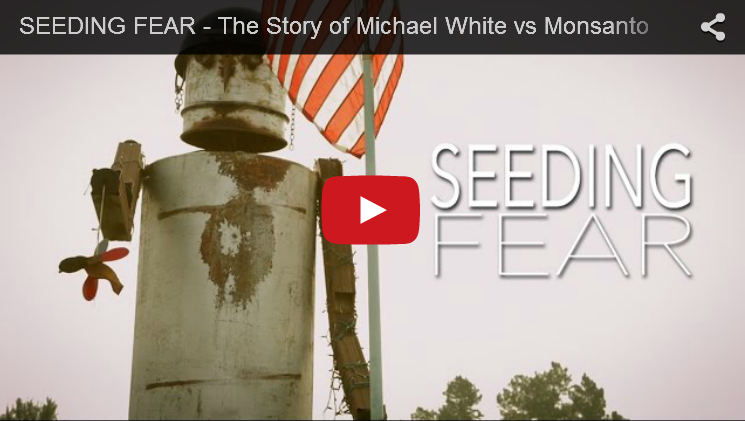 Thanks for reading this and I hope you look at this simple and powerful film, “Seeding Fear”.